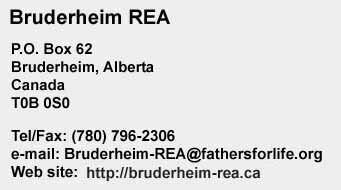 None of the information in the various input fields in the e-mail form is mandatory, but if you wish to have a response or to be subscribed to the mailing list of the Bruderheim REA (it's free but not a discussion forum), you must provide at the very least your e-mail address. If you don't leave your e-mail address, there is no possible way to respond to you; and it is also not likely that your message will be read. The information presented at this website is intended for use by members of the Bruderheim REA. None of the information constitutes legal advice. All possible efforts are being made to keep the information accurate and correct, but, as all human endeavors, it is subject to human error. Therefore, no guaranty can be given that no errors are contained on any of the web pages of the Bruderheim REA. If in doubt about the accuracy of any specific statement, write to us, quoting the passage of concern and the website address where the passage can be found. We will then attempt to provide necessary clarifications and corrections, if necessary.